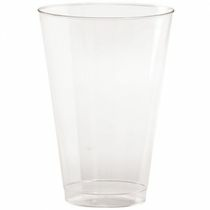 They say seeing is believing, but when it comes to this line of disposable dinnerware, the old maxim just doesn't apply. 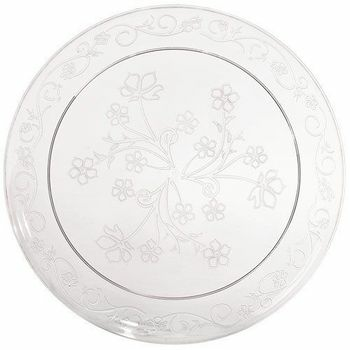 With a scrollwork design etched into the rim and a beautiful floral design adorning the center, you'll have to touch these dazzling, scrollware plastic plates to believe that they aren't the finest crystal. Available in four different plate sizes and two different size bowls you can create a beautiful table setting with this magnificent collection. D'Vine 10" Clear Plastic Scroll Dinner Plates 20ct. D'Vine 9" Clear Plastic Scroll Luncheon Plates 20ct. D'Vine 7" Clear Plastic Scroll Salad Plates 20ct. 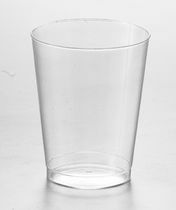 D'Vine 6.25" Clear Plastic Scroll Dessert Plates 20 ct.
D'Vine 10oz. Clear Plastic Scroll Bowls 20ct. D'Vine 6oz. Clear Plastic Scroll Bowls 20ct.